When can you use Pharika, God of Affliction's activated ability? Denitar on Curse Tribal EDH! Thanks for the feedback! Agent of Erebos seems like a great addition, so I'll be looking for space to add it! 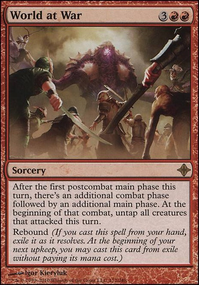 The hope is that the two commanders will help with card draw either by attacking themselves early game or with various tokens from Thopter Spy Network , Sigil of the Empty Throne , or Luminarch Ascension into the mid and late game. This plan is definitely fairly meta-dependent and not always reliable, though. Ravenrose on Curse Tribal EDH! Trust me when I say this: you need to add Agent of Erebos to this deck. Whenever you cast an enchantment, you exile someone's grave. That is power. You need card draw in this deck. Try Divination , Read the Bones , Brainstorm , Ponder and Portent . Agent of Erebos fair enough, build to your meta. You may find that other cards like Deadeye Tracker give you a bit more utility though. card draw and giving itself counters are nice upsides. My main concern with the Cephalid Constable is that you don't really have any ways to give him evasion, so actually dealing combat damage to get the trigger seems somewhat difficult. Patron of the Vein If you need the grave hate then I suppose, but CMC6 is fairly high up there for this. 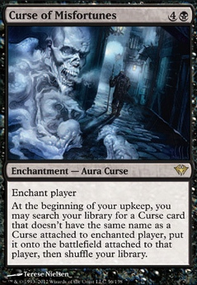 You might be better served with a lower CMC method of dealing with this issue, especially where creature removal is fairly easy to come by with cards like Plaguecrafter Fleshbag Marauder Grave Pact and hundreds of black removal spells. 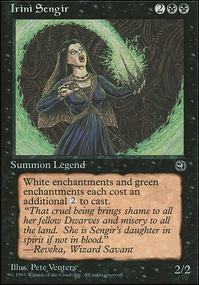 Withered Wretch might be a better option in some ways, and Kalitas, Traitor of Ghet is definitely a better bang for your buck. instead of Dross Harvester you may want something you have a bit more control over such as Wurmcoil Engine or Basilisk Collar that way you can directly manage your life total rather than letting it change by happenstance. 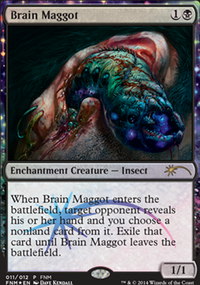 not to mention that wurmcoil is extremely good when you can repeatedly sacrifice it. 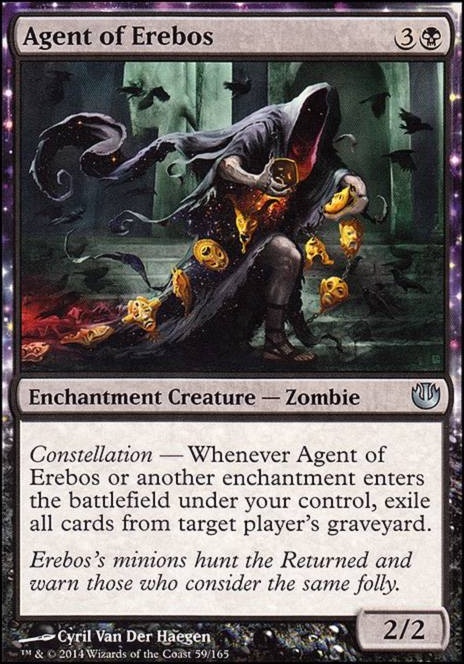 Agent of Erebos is repeatable ETB grave hate - I have a lot of graveyard recursion in my meta, and the ability to repeatedly exile the graveyard of the multiple Muldrotha, Meren, and Tasigur decks I face prompted the addition. Cephalid Constable lets me bounce multiple permanents - as he gets bigger, he bounces more stuff. Grixis has trouble with enchantments specifically. Early on, he can be absolutely crippling, because you can bounce lands. And as a Wizard, it's easy to give him a counter. Patron of the Vein is not there for Vampire synergy. He's unconditional creature removal on an ETB, he triggers an exile so I get grave hate, and when his exile trigger resolves he puts a +1/+1 counter on himself. This means he takes care of his own counter as long as I'm getting rid of creatures. 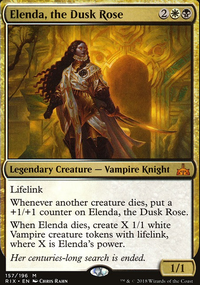 Any other vampires who get counters are just bonus, and not at all required. I can just loop sacrificing him and letting him ETB again every turn. Storm the Vault Flip I agree is likely just winmore. I have a lot of ramp already. Dross Harvester was mentioned in a Reddit thread as an effective way to get some life back when you dip too low. I agree that it should be cut - I can always test it later if I find myself getting too low on life. Storm the Vault Flip Agent of Erebos Cephalid Constable & Dross Harvester seem like odd choices and I'd probably cut them. Also you only have 4 vampires, so I don't think Patron of the Vein is really worthwhile. Changes Out Agent of Erebos - other ways to remove cards from graves. Crystal Chimes - to 1 sided Sengir Nosferatu - out Suture Priest - good but gives a market on your head early on. Thespian's Stage - out for Swamp. 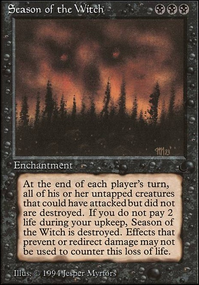 I’d suggest playing more dual typed cards such as Solemn Simulacrum, Tree of Tales cycle, Nyx Weaver, Agent of Erebos. And I’d play things like Tireless Tracker and Titania, Protector of Argoth. The one is useful for card draw or artifact fodder and will get the buff regardless how you sac the clue. Where as if you sac a bunch of lands you can create a decent sized army.